This stunning Mid-Century Modern decorative dish was hand blown in Murano, Italy- the islands off the coast of Venice, centuries renowned for its superlative glass production, circa 1950. The shape of the dish cleverly suggests a stylized peacock. Affixed to the front of the dish is a gestural translucent glass head with a beak and comb, while the rear of the dish gently ascending upwards forming the bird's tail feathers. The color of the dish presents an ombré scheme in a soothing palate transitioning from a rose quartz blush to emerald with a sapphire border adorning the undulating rim of the piece. While this piece is a perfectly functional decorative bowl- ideal for presenting candies, olives, or any number of edible treats- it is also an objet d'art in its own right, that would be a stunning addition atop any étagère or side table. Excellent condition. Italy, circa 1950. Dimensions: 7" diameter x 6.25" height. Heavy Mid-Century Modern Murano decorative glass bowl. Having Yellow pink and clear glass swirling with style. Italian 1970s Murano glass candy dish in handblown glass with a sparkling rose gold and burgundy swirl pattern with a dusting of yellow gold on top. 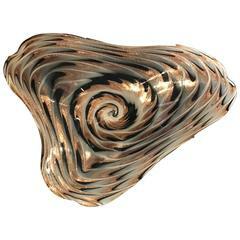 Murano glass bowl, handblown with black, brown and white swirl design.